Its a scary to think that it’s been more than 10 years since we moved into our first Tasmanian rental. Huonville sounded nice, but a little too far. New Norfolk also seemed like a good option, yet nothing seemed ‘just right’. The most important criteria was a place with plenty of land so that our German Shepherd could stretch her legs and enjoy the occasional pursuit of some small creature. There was never any fear of carnage, as she always got stage fright whenever she got anywhere near touching distance! Granton was where we eventually settled, at the end of a long dirt road with fantastic views across the river Derwent, towards the bright lights and weatherboard sights of Bridgewater (not quite so genteel as South Australia’s Bridgewater from whence we came…). As fate would have it, it just so happened that the rear of our property adjoined the property of one Stefano Lubiana. With just as fearsome a reputation for fine wine as they have today, the real difference is in the environment in which they dole out their tiny measures of liquid ecstasy. If my memory doesn’t fail me, back then it was a colorbond shed and a few hay bales. Today? 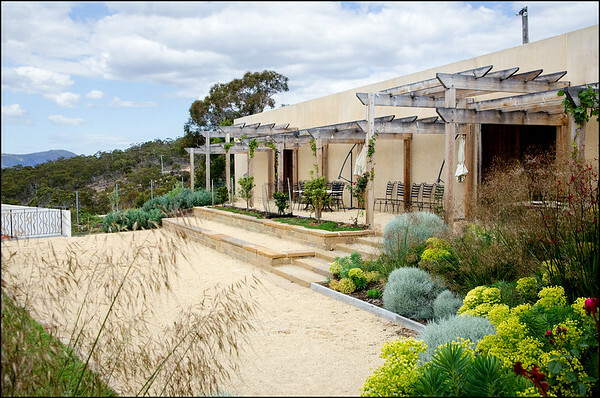 It’s nothing but gorgeous sandstone and timber! It’s always a good sign when a venue can’t accommodate you at your preferred time! 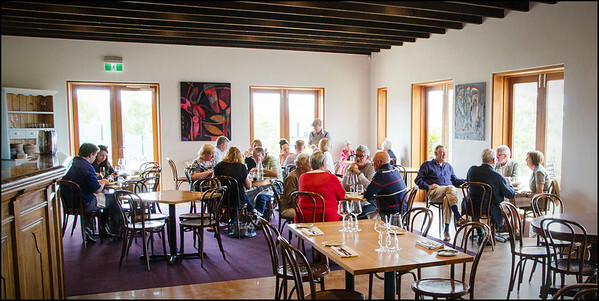 While the surrounding tables were either filled, or filling fast around us, the impact on service was negligible, with the wait staff presenting themselves in a friendly and highly professional manner befitting the best venues in Hobart. 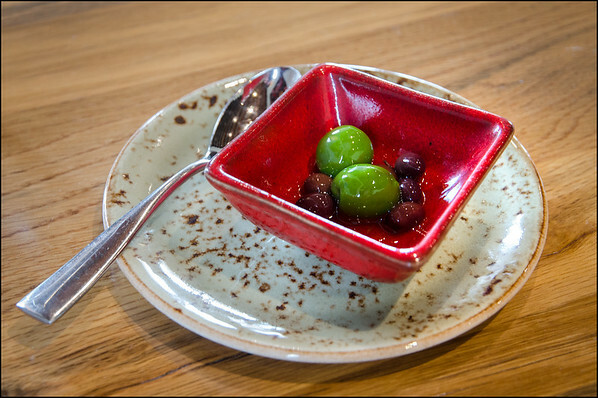 As always, we were keen to sample a cross-section of their menu, and so with a couple of glasses of wine in hand we grazed on the complimentary olives and perused the menu. Entree 1 – ‘Ostriche’: No, not the feathered variety!! 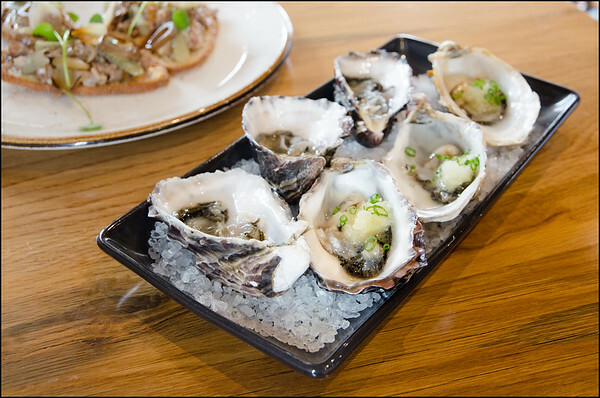 A half dozen oysters, three natural and three with lemon granita and fresh chives for $18. As always, natural was the better choice, but the alternative was refreshing and tasty nonetheless. 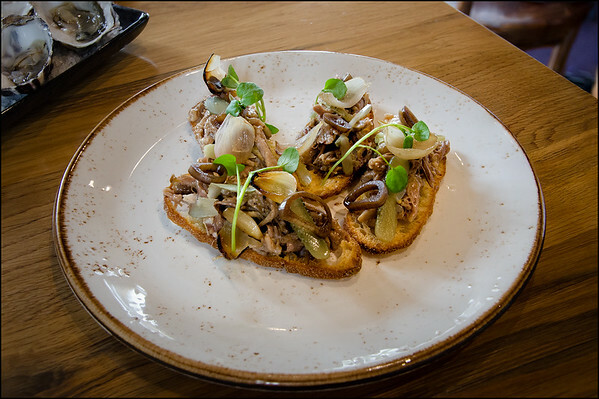 Entree 2 – ‘Tonno di Maiale’: Pork rilletes, roast shallots and cornichons ($16). In hindsight going the fingers was probably a little uncouth, but you don’t eat toast with a knife and fork right? The rillettes were decadently rich, with a surprisingly firm texture compared to many others I’ve eaten previously. A sumptuous start to the meal. 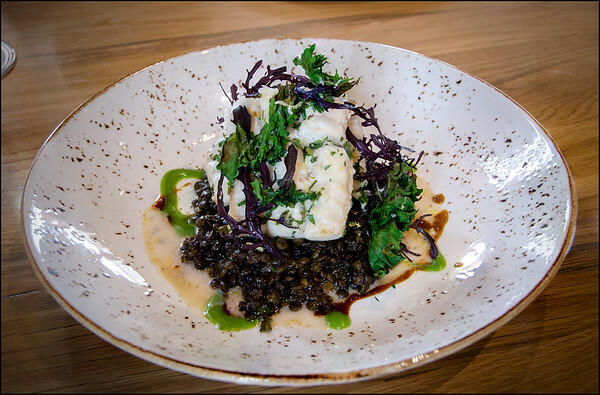 Main 1 – ‘Pesce’: Steamed ling, puy lentils, shellfish reduction, gremolata and kale ($36). 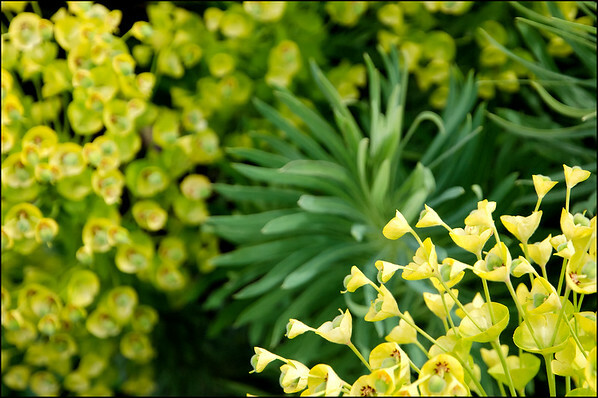 The ling was supremely delicate, clearly cooked with equal measures of soul and precision. The lentils added a much needed body to the dish, with the kale and gremolata providing occasional, yet welcome textural and zesty interludes. 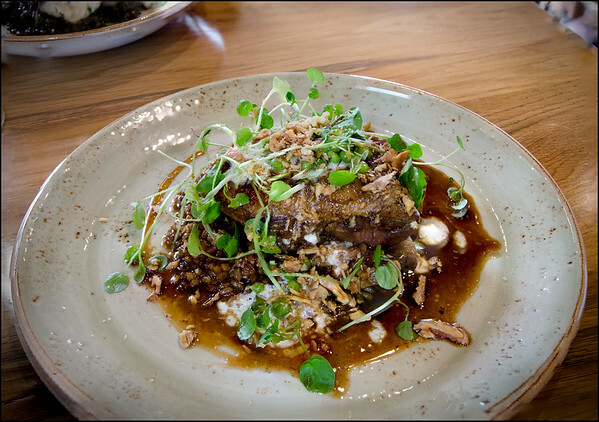 Main 2 – ‘Agnello’: Slow cooked lamb shoulder, biodynamic farro, green olives, walnuts, house verjuice and biodynamic yoghurt ($36). It turns out I like it. A lot!! There’s a lot going on with this dish, yet unlike many, all the ingredients played off each other brilliantly. The tender lamb evoked memories of holidays at grandpas dairy farm, with the farro providing a uniquely funky earthiness to the dish that took me from the dinner table and out to the milking yard of all places! At the same time the tartness of the yoghurt and verjuice drew me back from the traditional, throwing me forward to the multicultural present. A sublime dish. 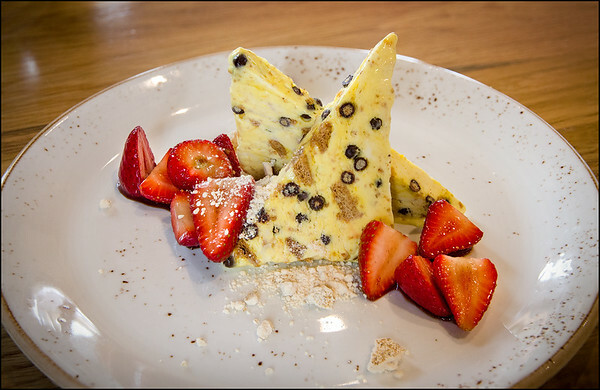 Dessert 1 – ‘Semifreddo’: Spiced biscotti and chocolate crispearl semifreddo with balsamic strawberries ($14). I’m not exaggerating when I say that this was one of the best desserts I’ve had the pleasure of tasting anywhere in the world! Again, the perfect combination of traditional and progressive. The semifreddo was an exercise in classical technique, yet lifted and beautifully mutated though the integration of the spicy and sweet combination of biscotti and crispearl. Throw in some meringue crumb and those deliciously fresh strawberries and you have one little plate of heaven. 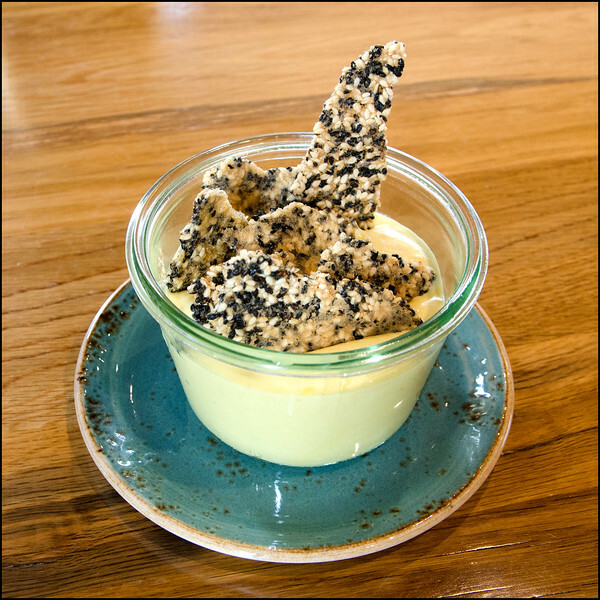 Dessert 2 – ‘Zabaione’: French Maran egg zabaglione, marsala and sesame crackers ($14). French Marans – A breed of chicken from the port town of Marans, in the western France. It was created with the local feral chickens descended from fighting game chickens carried from Indonesia and India. Those original Marandaise fowl were “improved” for the table through recombination with imported Croad Langshans. It is a dual purpose fowl known both for its extremely dark eggs and fine meat qualities. Zabaione – an Italian dessert, or sometimes a beverage, made with egg yolks, sugar, and a sweet wine (usually Marsala wine). The dessert version is a light custard, whipped to incorporate a large amount of air. Nice. I’m guessing the marsala is in lieu if the wine. An odd, yet strangely tasty dessert. There’s a lot of sweet, velvety smooth ‘custard’ in that bowl which, for me anyway, set it apart from many other desserts I’ve tried. Not better, not worse, simply different, with the sesame cracker acting as a much needed textural foil, while also providing some interesting sesame flavours. In saying that, Karen (who chose it!) absolutely loved it! 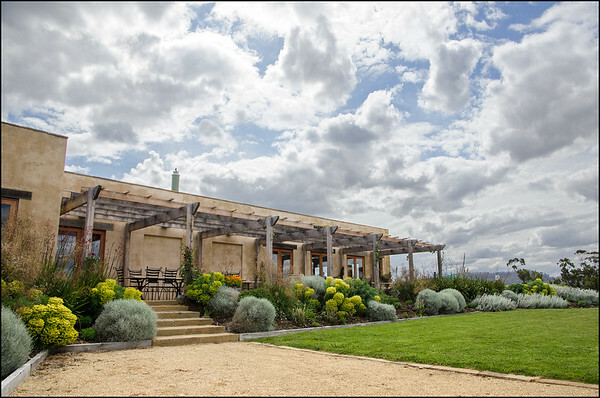 If the great food wasn’t enough, we only had to step outside to admire the beautiful gardens, the biodynamic vege patch from which many of the fresh ingredients are sourced, and the gorgeous views of the river. Come summer time and I can see this outdoors area as being the perfect place to kick back with a wine or three, a few friends and a genuine desire to waste the day away. Alternatively, it would also make for a fantastic wedding venue! Overall thoughts of Osteria at Stefano Lubiana? 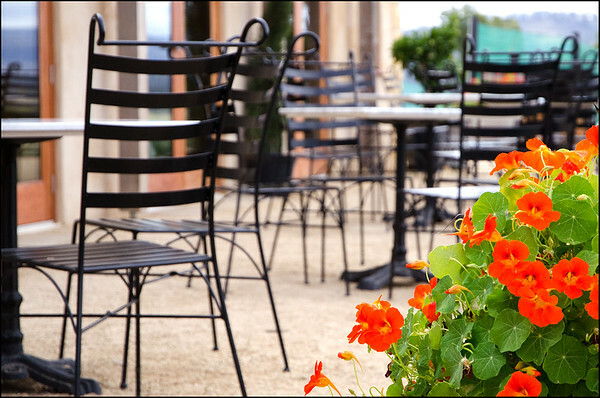 It’s no surprise that we absolutely adored Osteria at Stefano Lubiana. When it comes to Italian food in Hobart we’ve found that with each venue we try, the bar keeps rising higher and higher! From Don Camillo, to Maldini, to Capital, and now Osteria…we’re spoilt for choice, and we haven’t even tried The Italian Pantry or Cultura yet! 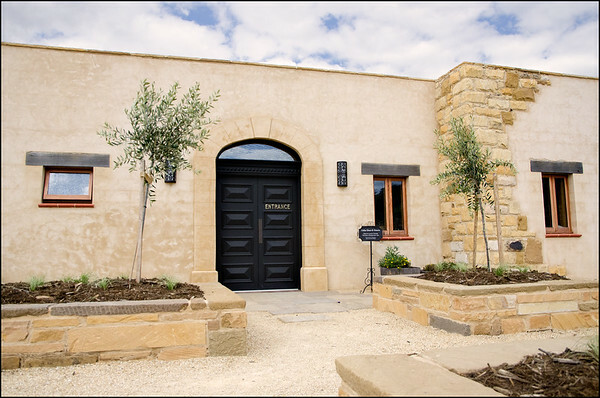 One fantastic aspect of Osteria is how many options it provides, from a simple wine tasting at their cellar door, to a light meal, to a three course lunch with all the trimmings (yes, guilty as charged!). 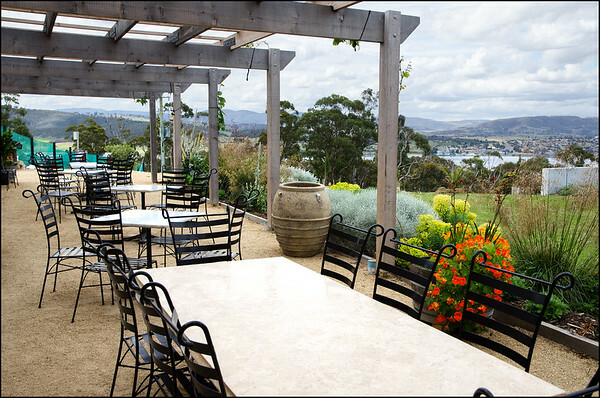 The quality of their ingredients is second to none, making the absolute most of their own garden, and the seasonal produce for which Tasmania is renowned. Just as important as the food in establishing the right mood is the accompanying service, and in this case it is easily some of the best we’ve encountered in Hobart. So friendly, with a genuine passion for ensuring the entire experience is flawless from start to finish. It’s that attention to detail that makes all the difference in an increasingly high quality array of Tasmanian dining options! 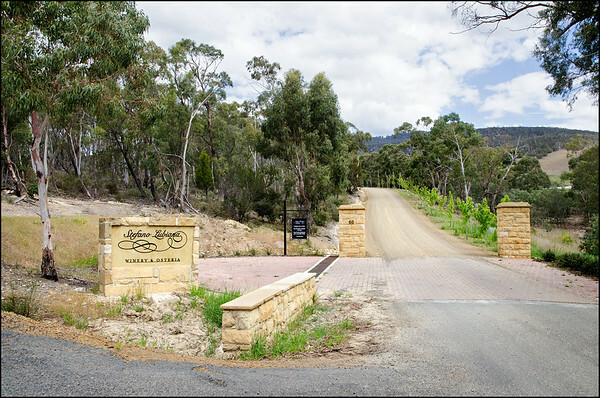 Stefano Lubiana Winery can be found at 60 Rowbottoms Road, Granton, about 20 minutes from central Hobart. The only criticism I can offer at all is that they don’t open for dinner! News just in! Apparently over the summer months there will be a dinner option on Saturday nights!! Thanks so much for your lovely review, we are so glad you enjoyed your time here, especially as you’re neighbors! Just want to let you know that over summer we will be open for dinner on Saturday nights too! It was our pleasure to drop by Amber! Please pass on our thanks to the team. While we really enjoyed living on Rowbottoms Rd, we ended up buying some land out at Richmond and built our own place. It’s still great to go for a drive though and see how the old neighbourhood is going. Even better when there’s a great meal and a bottle of wine there as well! That’s fantastic to hear about the dinner option. I’ll update the blog to reflect that information.